Specialising in furniture, product and spacial design, Lars Olav Dybdal and Wilhelm Grieg Teisner are the two halves of Oslo-based Gridy (the name is a blend of their surnames). They met while studying at the Bergen Academy of Art and Design and continued collaborating after graduation. One of their first achievements as Gridy was being selected for 100% Norway’s 2011 show, where their Spiff lamp won acclaim and was later picked up for production by Northern Lighting. A member of the Norwegian Designers Union, Gridy has exhibited widely since then, aiming to create simple, honest products that are both user-friendly and recognisably Nordic. Gridy’s work frequently combines a rational approach and traditional craft practices with elements of humour to shape designs that have personality and character. This year, the duo presents Lolly, a stackable stool (or side table) inspired by lollipop sticks, designed for both domestic and public spaces. Made in solid oak, Lolly uses craft and joinery techniques to create a contemporary look, and comes in three pieces, easily assembled by the end user with four screws. Gridy has extended the Lolly family to include a two-seater bench, with a soft seat upholstered in fabric from Gudbrandsdalens Uldvarefabrik. 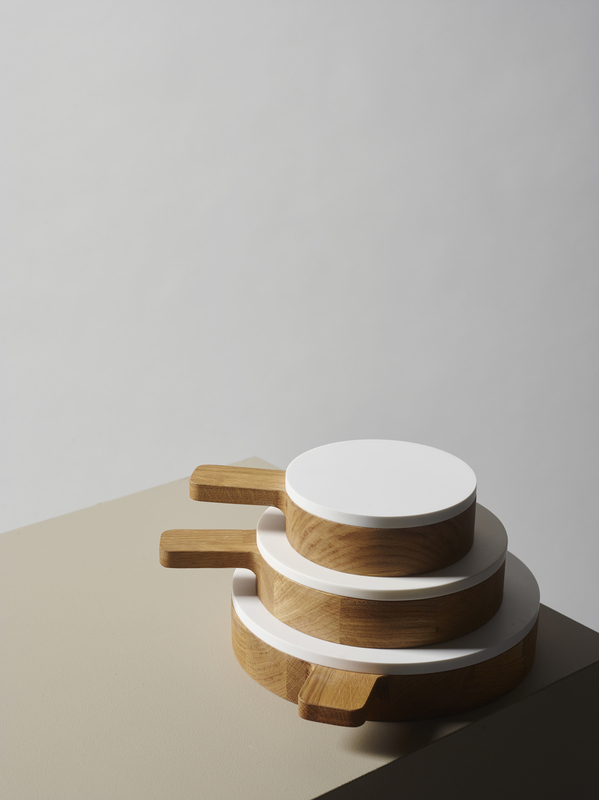 Alongside Lolly, Gridy presents Pan, a CNC-milled serving dish made from leftover materials from kitchen manufacture. Available in three sizes, the dish has many functions including, for example, a breadbasket and fruit bowl. It is fitted with a handle, and includes a Corian lid cutting-board, creating a material contrast with the solid wood of the serving bowl.